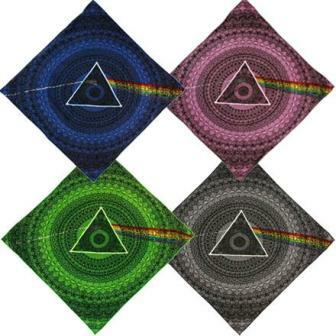 Pink Floyd bandana has icons & image from the Dark Side of the Moon album. Slightly different look than our Pink Floyd "lyric" bandana. It is a super high quality bandana that is made of 100% cotton. Available in 4 different colors. It measures 22" x 22". Officially licensed Pink Floyd merchandise.